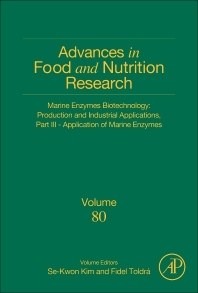 Marine Enzymes Biotechnology: Production and Industrial Applications, Part III, Application of Marine Enzymes provides a huge treasure trove of information on marine organisms and how they are not only good candidates for enzyme production, but also a rich source of biological molecules that are of potential interest to various industries. Marine enzymes such as amylases, carboxymethylcellulases, proteases, chitinases, keratinases, xylanases, agarases, lipases, peroxidase, and tyrosinases are widely used in the industry for the manufacture of pharmaceuticals, foods, beverages, and confectioneries, as well as in textile and leather processing and waste water treatment. The majority of the enzymes used in the industry are of microbial origin because microbial enzymes are relatively more stable than the corresponding enzymes derived from plants and animals. Professor Se-Kwon Kim, PhD, currently serves as a senior professor in the Department of Chemistry and the director of the Marine Bioprocess Research Center (MBPRC) at Pukyong National University in the Republic of Korea. He received his BSc, MSc, and PhD from the Pukyong National University and joined as a faculty member. He has previously served as a scientist in the University of Illinois, Urbana-Champaign, Illinois (1988-1989), and was a visiting scientist at the Memorial University of Newfoundland, Canada (1999-2000). Professor Se-Kwon Kim was the first president of the Korean Society of Chitin and Chitosan (1986-1990) and the Korean Society of Marine Biotechnology (2006-2007). He was also the chairman for the 7th Asia-Pacific Chitin and Chitosan Symposium, which was held in South Korea in 2006. He is one of the board members of the International Society of Marine Biotechnology and the International Society for Nutraceuticals and Functional Foods. Moreover, he was the editor in chief of the Korean Journal of Life Sciences (1995-1997), the Korean Journal of Fisheries Science and Technology (2006-2007), and the Korean Journal of Marine Bioscience and Biotechnology (2006-present). His research has been credited with the best paper award from the American Oil Chemist’s Society (AOCS) and the Korean Society of Fisheries Science and Technology in 2002. Professor Se-Kwon Kim’s major research interests are investigation and development of bioactive substances derived from marine organisms and their application in oriental medicine, nutraceuticals, and cosmeceuticals via marine bioprocessing and mass- production technologies. He has also conducted research on the development of bioactive materials from marine organisms for applications in oriental medicine, cosmeceuticals, and nutraceuticals. To date, he has authored over 600 research papers and holds 152 patents. In addition, he has written or edited more than 60 books. Fidel Toldra holds a PhD in Chemistry (1984) and is Research Professor at the Instituto de Agroquimica y Tecnologia de Alimentos (CSIC) located in Paterna (Valencia, Spain) where he leaders the group on Biochemistry, technology and innovation of meat and meat products. He was a Fulbright postdoctoral scholar at Purdue University (West Lafayette, Indiana, 1985-86) and visiting scientist at the University of Wisconsin (Madison, Wisconsin, 1991 and 1995), and the Institute of Food Research (Bristol, UK, 1987). Prof. Toldra has filed 11 patents, published over 285 manuscripts in scientific journals and >125 chapters of books. He holds in 2017 an h index of 49. His research interests are focused on food biochemistry and the development of new analytical methodologies, focusing on the improvement of quality, safety, nutrition and health of foods of animal origin, especially meat and meat products. Prof. Toldra is the European Editor of Trends in Food Science and Technology (2005-current) and Associate Editor of Meat Science (2014-current); he was Editor-in-Chief of Current Nutrition & Food Science and section Editor of the Journal of Muscle Foods. He is a member of the Editorial Boards of Food Chemistry, Current Opinion in Food Science, Journal of Food Engineering, Food Analytical Methods, Journal of Food and Nutrition Research, Recent Patents in Agriculture, Food and Nutrition, The Open Nutrition Journal, Food Science & Nutrition, International Journal of Molecular Sciences and Food Science & Human Wellness. He has edited/Co-edited more than 40 books for known publishers (CRC Press, Springer, Wiley-Blackwell, Academic Press and Elsevier). He is one of the 3 Editors-in-Chief of the Encyclopedia of Food and Health, published in September 2015 by Academic Press/Elsevier. Prof. Toldra has received the Iber Award on Food and Cardiovascular Diseases, the 2001 Danone Institute Award in Food, Nutrition and Health, the 2002 International Prize for Meat Science and Technology given by the International Meat Secretariat, the 2002 GEA award on R+D activity in agro-food, the 2010 Distinguished Research Award and the 2014 Meat processing Award, both of the American Meat Science Association and the 2015 Dupont Science Award. He is a Fellow of the International Academy of Food Science and Technology (IAFOST) and a Fellow of the Institute of Food Technologists (IFT). Prof. Toldra served at Panels on Food Additives and on Flavorings, enzymes, processing aids and food contact materials of the European Food Safety Authority (EFSA, 2003-15) and Chairman of the Working groups on Irradiation (2009-10), Processing Aids (2011-14) and Enzymes (2010-15). In 2008-09 he joined the FAO/WHO group of experts to evaluate chlorine-based disinfectants in the processing of foods.